Marvel Avengers Heroes and Villains Pint Glass 2-Pack:Make amends and have a drink with your arch enemy with this sweet Marvel Avengers Heroes and Villains Pint Glass 2-Pack. 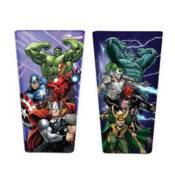 The set includes a heroes glass which features Hulk, Iron Man, Captain America, and Thor, as well as a villains glass depicting Abomination, Whiplash, Red Skull, and Loki. Each glass holds approximately 16 ounces. Hand wash only. Not dishwasher safe. Do not microwave.